Landscape Use: Colorful ground cover accent for sun, light shade and shaded areas in mesic and oasis landscape design themes, formal gardens, container plant (both black and green), hanging baskets. Best used in areas that are close to human traffic. Form & Character: Trailing herbaceous perennial, prostrate, tender, formal. Growth Habit: Evergreen, moderately to rapidly spreading to 10 feet in width, rarely above 1 foot in height. Foliage/Texture: Large foliage to 3 inches in length, often lobed sometimes deeply, leaves variously uni- or multi-colored from light green to deep burgundy, stems tender and succulent, produces large edible (though white and starchy) tuberous roots; coarse texture. Flowers & Fruits: Most ornamental forms rarely flower or fruit, and "black" leaf forms are more likely to flower than green leaf forms. Otherwise flowers are cupped with fused petals, pale pink to violet; rarely fruits. Temperature: Damage by freezing temperatures and excessive heat (above 110oF). Light: Dappled sun to light shade best. Foliar color subdued by deep shade. Foliage is unable to tolerate full sun and reflective western exposures. Soil: Intolerant of highly alkaline soil. If soil pH is above 8.0, then treat soil with acid forming fertilizers such as sulfur-coated urea or elemental sulfur to lower pH. Pruning: Heading cuts to contain and train prostrate spreading habit or promote foliar vigor. Propagation: Easiest to root herbaceous stem cuttings. Disease and pests: Whiteflies, thrips, and aphids are the major potential pest problems in Phoenix. Additional comments: Sweet potato is the seventh most important food crop in the world. 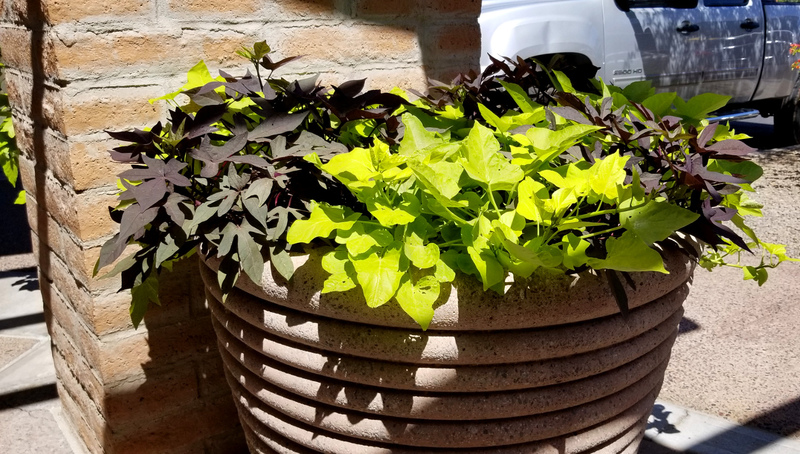 Ornamental sweet potato has recently become a popular trailing landscape plant for shaded gardens, large monoculture containers or in larger combination planters as a temporary spreading ground cover. There are many varieties including: 'Blackie' with burgundy-black foliage; 'Marguerite' with lemon lime or chartreuse foliage and a graceful cascading habit; 'Terrace Lime' is similar to �Marguerite' but comes from tissue culture and has a shrubby growth habit; 'Lady Fingers' has medium green leaves that are deeply lobed with burgundy stems and veins; 'Tricolor' or 'Pink Frost' is variegated with violet-pink and blush; and plants in the 'Sweet Caroline' series show a variety of leaf colors and generally have smaller root systems' 'Ace of Spades' is similar to 'Marguerite' in growth habit but with black leaves and doesn't grow as fast as 'Blackie'. 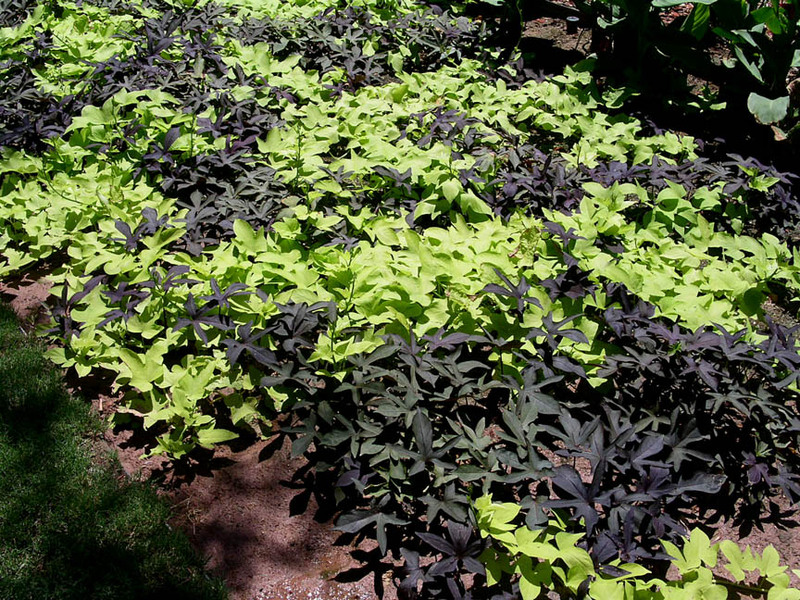 Ornamental sweet potato is a 'heavy feeder' that performs best in an evenly moist fertile garden soil. 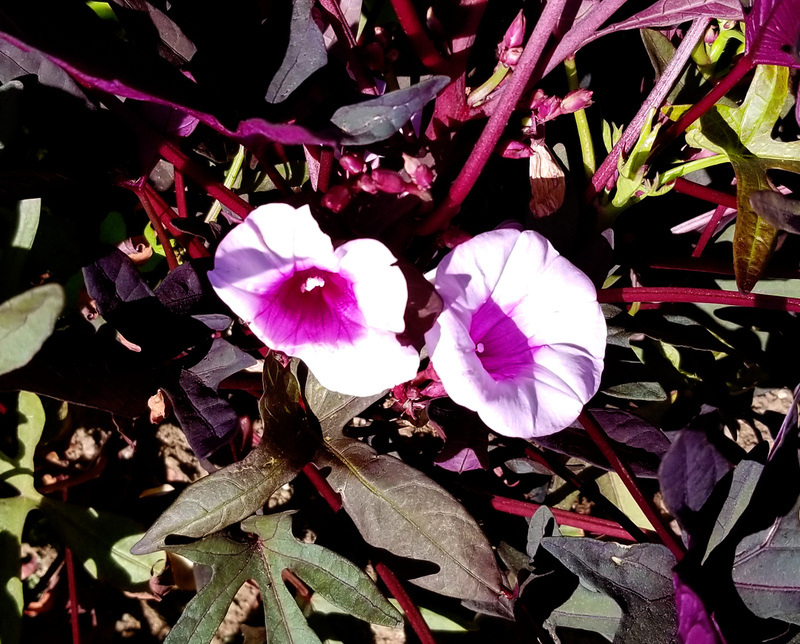 Ornamental sweet potato can be grown in Prescott, Flagstaff and Payson as a summer annual.